tuHOST.mx Review 2019: Is tuHOST.mx a Good Hosting? tuHOST.mx is a Mexican web hosting company offering low-cost shared hosting services. Its signup process is a bit suspicious, so be careful when considering this host. tuHOST.mx is a Mexican web hosting company that has been in operation since 2008. With servers located in the United States, it offers a nice set of services at a great price. However, be careful when considering this host, as its signup process is suspicious. There are a few features that make tuHOST.mx stand out from other providers. That includes support for Ruby on Rails and CGI-bin along with multiple versions of PHP. Also, this host provides Cloudflare CDN and protection for your website as a nice freebie. You’ll also have access to cron jobs, Zend, ionCube, and cURL. tuHOST.mx also offers features perfect for beginners, including the My Site Builder Lab with over 180 templates, online webstore tools, payment processing tools, and SEO tools to help you rank well on Google. Also, it offers the Softaculous auto-installer with hundreds of apps, including WordPress, Joomla, and more. All plans are powered by cPanel, so experienced users will have no problems figuring out how to use this service. tuHOST.mx offers four levels of shared hosting with prices that are a lot lower than most providers. You can get a year’s hosting here for what you might pay for two months’ worth at other places. Also, all plans come with a free domain registration. Note that SSL certificates are not free with this host. This sounds great, but its signup process is a big red flag to me. The only way to sign up for service with tuHOST.mx is by contacting support. Also, the only payment options listed on the website are direct bank transfer or through Banamex transfer at Mexican 7-11 stores. Customer support informed me that tuHOST.mx also accepts PayPal for service. Personally, I find this a bit suspicious for a web hosting company to not have a payment system in place, especially one that’s been in business since 2008. If this were any other type of online merchant, I’d steer clear over concerns of them being scammy. tuHOST.mx has average options for support. It offers phone support, email support, and online ticket support. Support hours are not listed but the company hours are Monday through Friday from 9 am to 9 pm, so expect a response only during those times. Unfortunately, the company doesn’t offer a FAQ section, and the link on the website just loops back to the main support page. There also isn’t an option for live chat support, but you can contact them through Facebook and Twitter. According to Facebook, they answer messages there in a few hours. 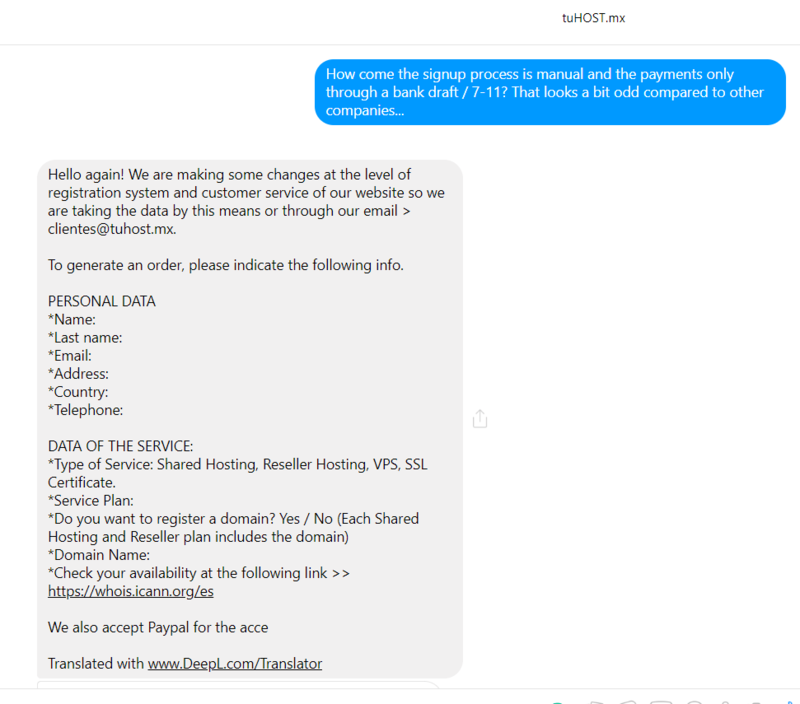 I contacted tuHOST.mx through Facebook to inquire about services and its signup process, and I received a response in a couple of hours. All agents speak Spanish, and it appears they use DeepL translator for their agents. The first reply was a natural answer, but the question about the signup process was a pre-packaged message. It appears that Facebook is the best way to contact support. While I’d like to recommend tuHOST.mx as a low-cost web hosting company, its signup process is too big of a red flag to ignore. I’d avoid this host until it can put proper systems in place for signup and payment. Get cheap shared hosting with tuHOST.mx. Wondering how tuHOST.mx stacks up against other Web Hosting companies? Enter any other Web Hosting company and we will give you a side-by-side comparison.